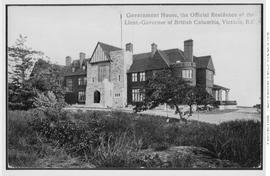 "Government House, the official residence of the Lieutenant Governor of British Columbia, Victoria BC." 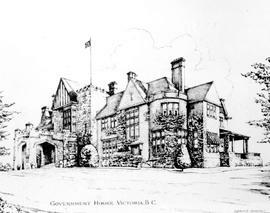 "New Government House, Victoria, BC; Department of Public Works; Office of the Chief Architect." "Pioneer Women of Vancouver Island" book committee and the author, Mrs. A. Bertrand Lugrin Shaw, in the front row centre, with fur at throat; tea at Government House, Victoria. "Pioneer Women of Vancouver Island"; tea held at Government House. A Fireplace In Government House, Victoria. A group of some of the pioneer women of Vancouver Island at a tea held in their honour at Government House, Victoria. A party held for the blind; left to right, Mrs. W.A.C. Bennett, Lieutenant Governor Frank Ross, Mrs. Ross, and Dr. Eric Martin, at Government House, Victoria. Aerial view of Government House, Victoria. After the fire at Government House, Victoria; aerial view of the ruins. An otherwise unidentified Christmas banquet at Government House; before the fire of April 1957. An unidentified Christmas event at Government House; before the fire of April, 1957. Ballroom At Government House, Victoria. Hand Painted Indian Design Ceiling Rim. Ballroom, Government House, Victoria, During Wallace Tenure Before Redecoration. Ballroom, Government House, Victoria; from the Samuel Maclure collection.